Harry Gwala Municipality Mayor Mluleki Ndobe addresses his supporters outside uMzimkhulu Magistrate’s Court shortly after murder charges against him were withdrawn. 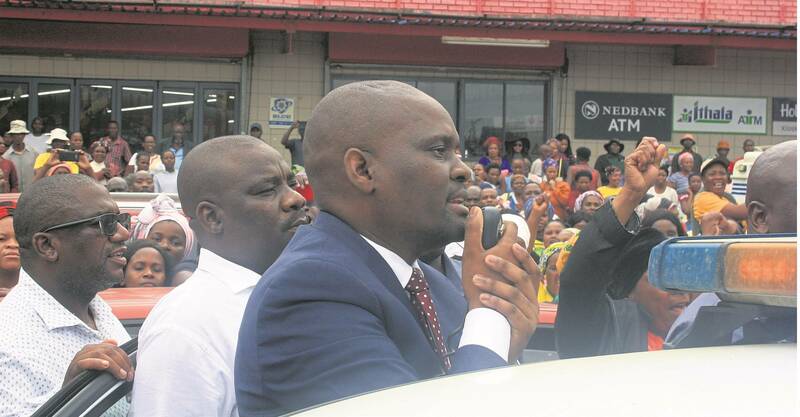 The family and friends of slain former ANC Youth League (ANCYL) secretary-general Sindiso Magaqa reacted with shock at Monday’s withdrawal of murder charges against Harry Gwala Municipality Mayor Mluleki Ndobe. “It is the least of things we had anticipated — the decision left us confused and as a family we strongly hope that justice will still prevail,” Magaqa’s brother, Lwazi, said. This after prosecutors, citing insufficient evidence, provisionally withdrew murder and attempted murder charges against Ndobe and Harry Gwala Municipal manager Zweliphansi Skhosana. The pair were among the five people, including Sbonelo Myeza and Mbulelo Mpofana, who had been arrested in connection with the 2017 murder of Magaqa — who died of gunshot wounds in hospital after being ambushed and shot in a parking lot in uMzimkhulu­. Ndobe, who had been in custody since his arrest a week ago, was in court for a bail application but state prosecutor Sohana Moodley told the court the bail application of the mayor and Skhosana would no longer be proceeding as the state had resolved to provisionally withdraw charges against the pair. “There are facts that need to be verified,” Moodley said. Moodley’s announcement was met with a stunned silence from the packed public gallery, where relatives of both Ndobe and Magaqa were seated. Ndobe, who did not show any emotion when Moodley announced the state’s decision, later told the media and scores of his supporters gathered outside court that while he was happy about his release, he was angry about his arrest. “It is not a child’s play to be put in hell for eight days, my name has been tarnished for the wrong reasons. “While the court has cleared our names, we have been judged in the court of public opinion,” he said. Supporters of Harry Gwala Municipality Mayor Mluleki Ndobe celebrated outside uMzimkhulu Magistrate’s Court after murder charges against him were provisionally withdrawn. Ndobe, who received a hero’s welcome from his supporters outside the court, was arrested by members of the political killings task team established by President Cyril Ramaphosa last year. Comprising investigators drawn from the Hawks, State Security Agency (SSA) police intelligence and the NPA, the task time has so far arrested several individuals — mostly ANC members — in connection with political murders and corruption that had been going on in the province in recent years. • Newcastle Municipality Mayor Ntuthuko Mhlaba, who is still in custody for the murder of ANCYL Emalahleni leader Wandile Ngobeni. • uMgungudlovu District Municipality Deputy Mayor Fucwana Zungu, who was briefly detained by the task team for corruption late last year but released a few hours after her arrest. • ANC Msunduzi Municipality councillor Nkosinathi Gambu, who is currently in custody following his arrest in connection with the murder of ANC Pietermaritzburg activist Musawenkosi Mchunu, who was gunned down at his home in kwaPata. 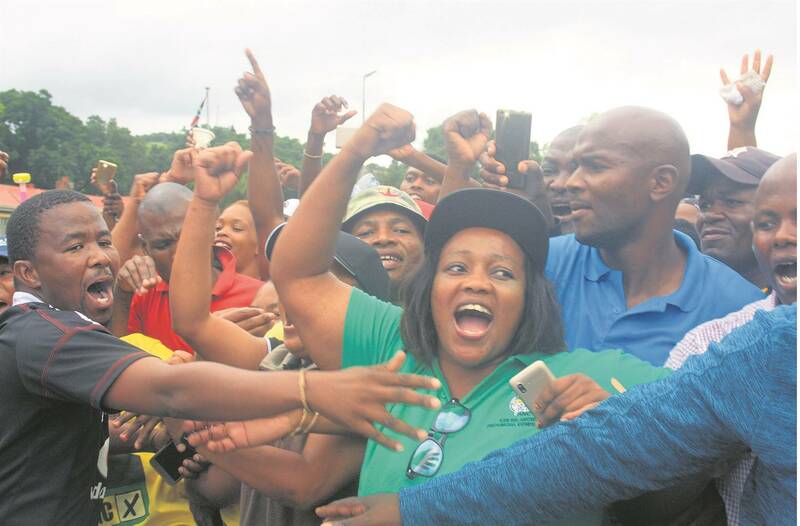 While Ndobe’s supporters celebrated his release, uMzimkhulu Local Municipality councillor Nontsikelelo Maba, who was in the car with Magaqa when the former ANCYL leader was shot, said he was taken aback by the state’s decision. “Honestly speaking, I was not expecting this — I really don’t know what to say,” she said. Mafa, who was injured during the shooting, still struggles to walk due to the injuries she sustained. Ndobe, who is currently an ANC provincial executive committee (PEC) member, is third on the party’s provincial list for the May 8 elections. The bail application for the remaining three accused will proceed in the same court on Tuesday.